You can see the two rows of setscrews.... Start with them loose, line up the milled flat on the cone with one set, and run the rear setscrew (the one closest to the muzzle) down until it just touches the brass.... I use the one where the Hatsan label is, just so I know where the flat is.... Run the rear setscrews up until they JUST touch the brass sleeve.... It is really easy to force the cone to one side when you tighten them (the dowel bends).... but if you watch the gap between the front of the cone and the hole in the stripper body, you can see when the screw just touches the brass.... When you are satisfied that you have all three of the rear setscrews JUST touching the brass cone, then screw in the front ones until they also just touch.... It's a bit tricky, but once you've done it a couple of times, you will get the feel of it.... Once you are sure that all six setscrews are just touching the brass cone, start tightening them, just a few degrees at a time.... Work your way around and around, first the back row, then the front.... gradually tightening the screws until they are good and snug.... The wooden guide should remain easy to slide throughout this process.... Once you have tightened all the screws, remove the tool, and then slide it back in place until the end is just ready to enter the muzzle.... It should be perfectly centered, no matter what orientation the tool is in.... and should slide easily into the muzzle.... DON'T FORGET TO REMOVE THE TOOL BEFORE LOADING AND FIRING THE GUN!!! Professor Bob at it again in his Mad Scientist's Lab! 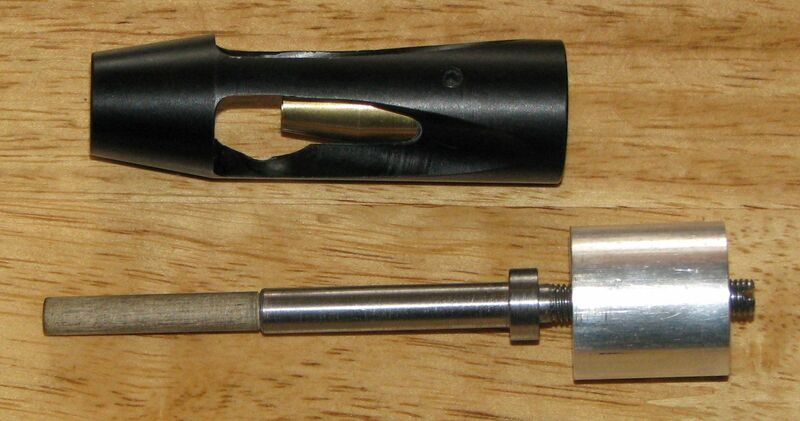 Thanks for inventing this tool, Bob, and thanks for the forum post with photos. I turned my version of the tool completely out of aluminum. It's much softer than the barrel and even softer than the brass insert/weight. Lacking a tap to thread the setscrew hole, I used a tiny drop of blue threadlock, which keeps the shaft from inadvertently turning for a long time before needing a renewal drop. More than a small amount results in actually locking the shaft, however. I decided to thread it 6-1mm for 1mm per turn. I did have a 6mm tap on hand to thread the "nut" but I single point threaded the shaft on my lathe. I also installed a 6mm lock nut as an option. I had to part off quite a bit of the air stripper in order to even get close to a 1 to 1-1/2 cal. (.177) gap. The length of the thread on my LGV barrel seems about typical to me, but I guess the Hatsan has a much longer threaded section. After shortening my air stripper to match my LGV, I turned a new taper with the compound to make it match the LGV's barrel OD and improve its appearance. When I get my sandblaster back in a new shop, I'll finish it with black Gun Kote. I'll also wait until I decide on extra setscrews but I guess I'm lucky, because my air stripper snugs up nicely without them, I think--at least as long as I use the tool when tightening the air stripper's setscrew. It is a slightly fussy process to get it concentric, however, but it was impossible without your tool and a second try is usually all it takes if the tool doesn't slide in the air stripper and bore easily. The most accurate pellet in my LGV is the JBS Exact Heavy, but I ran out of them part way through testing. I started at 1/2 caliber jump gap and increased the gap 1/2 mm at a time (1/2 turn), because 1mm was a bit too coarse even for a rough first pass. I found that 2-3/4 turns (2.75mm plus the minimum gap of 1/2 caliber) to be a good spot to fine turn the JSB Heavies more, but I ran out of JSB Heavy pellets and they are on backorder. 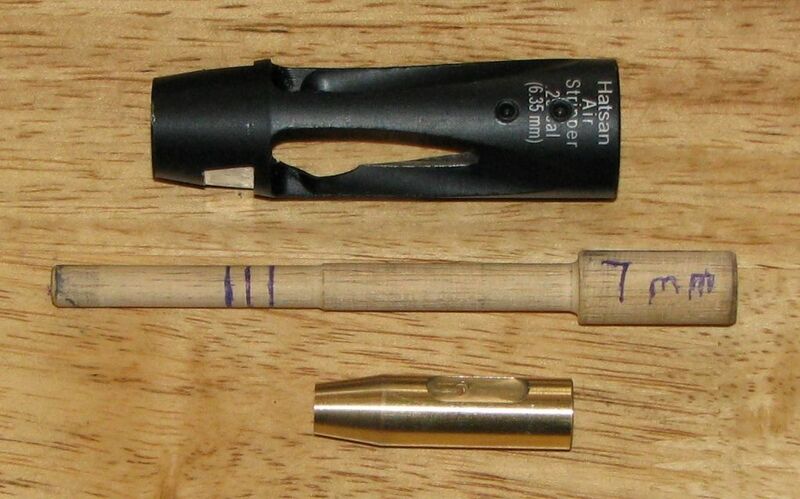 The next most accurate pellet I've found is the AA Field 4.51 mm followed by the JSB Exact 4.52mm. I'm almost out of AA pellets too so I did most of my testing today with JSB Exacts (in freezing early spring weather). I'm up to 1-1/2 turns out and you can see that the vertical stringing is going away. (The JSB Exact Heavies don't string vertically like that.) I started at 0 turns from minimum (1/2 caliber gap). There was a slight crosswind so I'm not too concerned about the horizontal dispersion. At you can see, my motivation is your Air Gun Guild challenge! I've never been able to do it without the air stripper and I"m hopeful that I can find the additional accuracy I'll need with the air stripper. Edit--I forgot to mention that I shot the challenge targets "backwards" (bottom right to upper left). Actually, I shot the challenge targets upside-down, because the page fits in my pellet trap clips better that way! The flier in the best target (upper left) is a pellet I took from a much newer tin of Exacts, when I came up one pellet short in the test pellet supply tin. Seems like I'm constantly running out of pellets! Actually, that one was the one I copied (except for the wood) and I thought I'd seen it here on the Guild first, so I replied here rather than GTA (and I am looking to participate in a new forum and I love "Ask Bob" and the "Prove It" Challenge here). In my coarse testing of the Exact Heavy pellets, I found two sweet spots (at 3 turns and 5 turns). 2-3/4 turns looks even better, initially, but I'll fine tune later and see which position is best when I get more Exact Heavy pellets. I ran out of those pellets but only got my coarse testing done up to 1-1/2 turns with the 8.44 gr. Exact yesterday in freezing weather. Now it's snowing again and we have snow covering the ground here north of Kettle Falls / Colville again today. You're probably getting even more white stuff up your way than here!